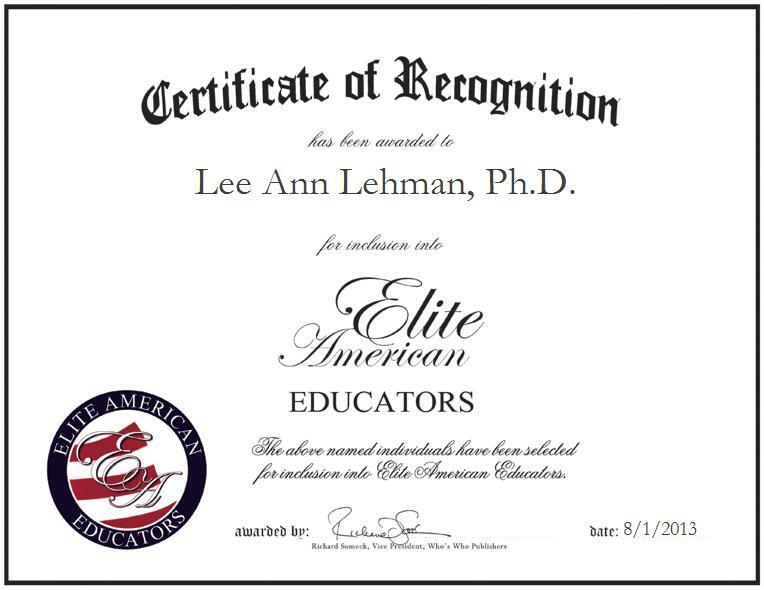 RIVIERA BEACH, FL, August 1, 2013, Lee Ann Lehman, Ph.D., Psychologist in Private Practice, and Adjunct Professor at Indian River State College, has been recognized by Elite American Educators for dedication, achievements, and leadership in early childhood intervention and counseling. Through the years, Dr. Lehman has nurtured a growing skill set, which currently enables her to adeptly perform research and clinical work for her clients, and teach human behavior and psychology. She makes the most of the knowledge that she has come to refine and build on over the course of a successful career by helping others. She specializes in early childhood intervention and adolescents and counseling therapy, and attributes her success to her mentors, and to her being a mentor, herself. When offering advice to others entering the field, Dr. Lehman advises that they choose what they want to specialize in, and what they truly love. She chose to work in the field of counseling because she had maintained a long standing interest in public welfare. She remains abreast of trends and developments in her field as a member of the National Association of School Psychologists, the National Association for the Education of Young Children, the Palm Beach Mental Health Association, and the American Psychologists Association. Contact Lee Ann Lehman, Ph.D.